A special thanks to New Holland for being one of only two flagship sponsors of Communities of Practice. Their support allows us to maintain this site as a service to all of agricultural education. 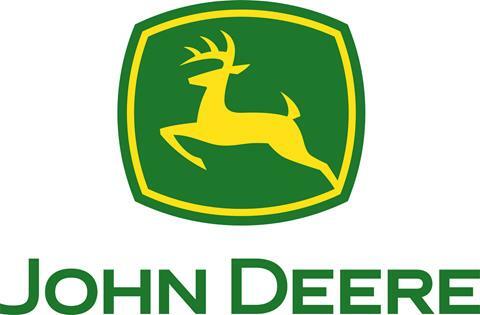 This sponsorship is a special project of the National FFA Foundation. A huge thanks to Zoetis for being one of only two flagship sponsors of Communities of Practice. Their support allows us to maintain this site as a service to all of agricultural education. This sponsorship is a special project of the National FFA Foundation. Last year, veterinarians and animal health resellers partnered with Zoetis to donate more than $1.3 million to FFA chapters across the country. Their support helps FFA chapters give their members hands-on opportunities, learn about careers and career success in agriculture, and participate in leadership development events. Click here to learn more about how to get your chapter involved in the Zoetis Industry Support Program. I remember my father asking me this question many times as a young man. His meaning was slow down, take a breath, and spend some time with those who matter the most. Student members will have more and larger scholarships available starting this year, thanks to a commitment from Growth Energy to provide $90,000 in funds over the next three years. There are a lot of ways you could tell the story of Paul Larson, agriculture teacher at Freedom High School in Freedom, Wisconsin. You could start with how, when Larson came to Freedom 29 years ago, the program was on the verge of extinction. Knowing that makes it even more impressive that today Larson?s agricultural education program reaches 200 students each year, and has the most advanced high school aquaculture facility in the state. Put that clearance candy from Valentine's day to good use with Cory Wedel's Ideas Unlimited-Winning Idea! Watch a 1-minute video explaining the lesson. (Special thanks to this summer's communication intern, Shelby Cooper for creating these videos!). 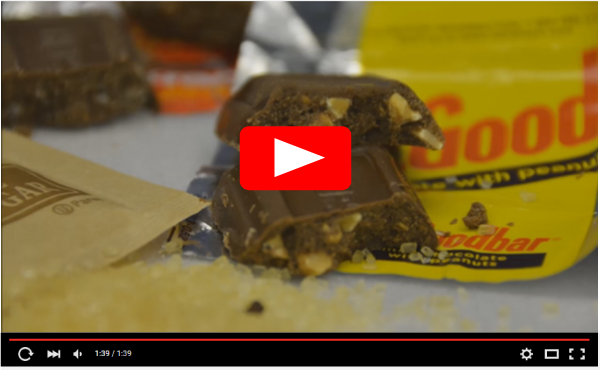 The NAAE Ideas Unlimited Award is sponsored by Cengage Learning | National Geographic Learning. 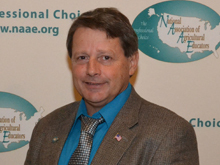 Mike Sheppard was selected as the 2015 NAAE Teacher Mentor for 2015. He?s been teaching agriculture for 16 years, and was nominated for the Teacher Mentor by his co-workers, both of who came to teach with Mike straight out of college. Get Mike?s take on what it means to be a mentor, what he misses about being a new ag teacher, and what kind of mentoring he thinks works best. Congratulations to Katrina Stewart, agriculture teacher at Bevier C4 High School in Bevier, Mo., and Russell Stoker, agriculture teacher at Keya Paha County Schools in Springview, Neb. These members were selected to receive a $2,000 grant from NAAE to either construct a greenhouse or enhance their current greenhouse facilities. The NAAE Greenhouse Construction/Enhancement Grant program is sponsored by International Greenhouse Company as a special project of the National FFA Foundation. Get a jump start on your NAAE awards application. The 2016 application instructions and supporting information for all NAAE awards is now available on the NAAE website. Although the online submission form is not yet open, applicants can use the materials that are available to create everything they'll need to upload once it opens. Regional award winners will be honored at the 2016 NAAE Convention in Las Vegas, November 29-December 3. If traveling overseas and helping farmers in developing countries learn appeals to you, consider signing up for the Farmer to Farmer program through NAAE. This is a 5-year initiative that relies on technical assistance from U.S. farmers, educators and others to help farmers in developing countries improve productivity, access new markets and conserve environmental and natural resources. We know there are more great stories out there. Read something that should make the blog? Send a link to NAAE Communications/ Marketing Director Julie Fritsch, and we?ll post it! Regional Conferences are great opportunities to network with other leaders in agricultural education from your part of the U.S. Conferences usually last 2-3 days and include ag tours, professional development, association business, and social events. NAAE and the National FFA Foundation are co-hosting the ag ed strand of the ACTE National Policy Seminar this year, February 29 - March 2, in the Washington, DC metropolitan area. We will be covering the registration fee for one representative per state agricultural education association to participate in this important conference. Details are here. Click here for ways to celebrate and advocate from ACTE. Freedom High School, Freedom, Wis. There are a lot of ways you could tell the story of Paul Larson, agriculture teacher at Freedom High School in Freedom, Wisconsin. You could start with how, when Larson came to Freedom 29 years ago, the program was on the verge of extinction. Knowing that makes it even more impressive that today Larson's agricultural education program reaches 200 students each year, and has the most advanced high school aquaculture facility in the state. You could talk about how Larson has been a teacher leader, volunteering countless hours and serving on the board of the Wisconsin Association of Agricultural Educators, as well as with NAAE. You could point out how he is constantly pushing himself to become an even better teacher. Two years ago Larson was selected as a NAAE National Agriscience Teacher Ambassador, a highly competitive professional development for which he had to submit an extensive application and commit to hours of training above and beyond his regular responsibilities. All of these things and more are the reasons why Larson was selected as the 2015 Outstanding Agriculture Teacher for Region 3, but what is really interesting is what he's done since receiving the award in New Orleans two months ago. "Well, I really started when I won the state level," said Larson. He not only sent a release about his award to his local paper, but to the larger regional paper that covers hs area. "They actually put it in, which was great," he said. "Then, when I won nationals, I didn't think they'd do anything, because they'd already done something about it earlier. So I pointed out our program's strong community connection and alumni support." It worked, because a reporter from the Appleton Post-Crescent visited Larson's program and did a full story, which ended up on the front page of the paper. With a regular readership of about 162,200 people, according to the paper's website, that's a lot of recognition for the Freedom High School agricultural education program. Even better, because that regional paper is part of the USA Today newspaper network, a blurb about Larson's award appeared in USA Today, which has an average weekday print circulation well over 1.5 million copies. "Getting recognition like that immediately draws the attention of your administration," said Larson. "Someone notices that something is going on. With the constant change in administration that happens at a lot of schools, it's important to be validated in that way." Larson went on to point out that you don't have to with a national award draw attention, either. "It could be state level, or your section - you can spin it any way you want," he said. "The point is, you can use whatever recognition you get. Even if you're just nominated for an award, you can still say 'Hey, my peers think I was good enough to be nominated, so something's going on here.'" As great as the coverage from the Outstanding Teacher award has been, Larson sees it as a piece of a bigger picture. "It's all about relationships," he said. "Working with alumni - don't be afraid to ask for help. When people come help you train a judging team, or work with your students on something else, they'll talk to other people, and they'll be your advocate as well. That gives more credence than anything." Larson and his students also do an annual report that they present to his school board, usually right after they return from National FFA Convention. It also is ready to pull out whenever there is an opportunity to advocate for his program. He has shared his report with NAAE, and welcomes any ag teacher to use it to create their own. You can see that example here, as well as another, more state-focused advocacy piece Larson created here. Be visible - could be as simple as going to the local restaurant for lunch, or visiting the local feed store. Let people know you're there and what you're up to. Anytime you can be involved in community service with your students, do it. Don't be afraid to do something with a group you haven't partnered with before. It can be a great way to find new supporters. Aim to have an article in your local paper each time it comes out to let people know what's happening with your program. Don't overlook things like articles in your school newsletter or school announcements. Your students can write and submit articles, all you have to do is review them. Mike Sheppard was selected as the 2015 NAAE Teacher Mentor for Region 1. He's been teaching agriculture for 16 years, and was nominated for the Teacher Mentor by his co-workers, both of who came to teach with Mike straight out of college. Get Mike's take on what it means to be a mentor, what he misses about being a new ag teacher, and what kind of mentoring he thinks works best. To me it means keeping our profession growing. Without good mentoring, teachers struggle, or don't make it at all. In order to keep ag teachers going, they need good mentors. A good mentor checks in pretty regularly, offers help, sees how you're doing, offers moral support. I didn't have a mentor - not really. When I first started, I was in a single department school, and I had several people that I could call on in my district, so when I really got stuck, I would call them. Did that affect how you view mentoring now? The thing that affected that the most is my own daughter. She's an ag teacher too, in her 6th year. I've learned more from her than anyone else how important it is for somebody to have a mentor. She had others she could go to, but when you can go to your old ag teacher, or your dad, it's a little easier. She's been teaching for a while now, so she's offering help to others, even. I think the thing that holds a lot of people back is that for some reason we are afraid we're going to look bad if we ask for help, but if you can trust somebody, then it's easier. What is your favorite thing about being a more experienced ag teacher? Maybe the best thing is my past students. I see them quite a bit. I've got five students who are either student teaching now or in ag ed. That's the best thing is to just see how successful they're becoming. What do you miss about being a new ag teacher? Nothing. Not a thing. That first year was hard. Well, I can't say now that I didn't do something because I didn't know about it. I miss that a little (chuckles). What's one easy way for an experienced teacher to affect a young teacher? Pick out somebody you know, or a new teacher in your district, and several times during the year, check in on them. Don't pester them, but call them and see how they're doing. A simple thing like that can make a big difference. What's the toughest thing a new ag teacher faces? Classroom management. There's a lot to that. Having the kids engaged the entire class, dealing with behavior, dealing with kids, keeping up with their grades. With all three of the young teachers I've worked with recently, that's been it. Getting used to that aspect. What's the toughest thing a veteran ag teacher faces? All the changes that come across. We've had changes in way teachers are evaluated, requirements you have to fulfill. It seems like things keep getting added. What's better, formal or informal mentoring? Definitely informal. We tried the formal in Washington, assigning teachers to be mentors. We found that doesn't work. It's a little better when you have the new teachers pick, but it happens best when it happens naturally. You see new teachers there. That works best to find somebody close. It's really rewarding to mentor someone. It's just a good feeling to see somebody you helped out actually take your advice and do something good with it. It's one of the most rewarding things. It's just as rewarding as seeing one of your students being successful. The NAAE Teacher Mentor award is sponsored by CEV Multimedia. For more information about NAAE awards, visit http://www.naae.org/resources/awards/. Teach college students and junior lecturers about agribusiness development for farmers' cooperative organizations. Duration 3-4 weeks, Preferred dates: February-Mid-June 2016. 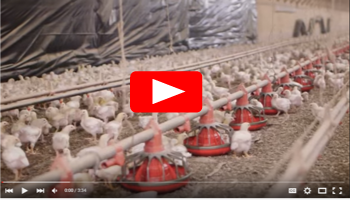 Train farmers on improved poultry production techniques. Includes basic breeding principles, understanding genetics, id of production birds, culling practices and more. Duration 2 weeks, Preferred dates: open. There are more than 30 assignments currently available on the Farmer to Farmer website. If you're interested in the Farmer to Farmer program, visit the program page on the NAAE website to get complete details or contact Julie Fritsch, NAAE Communications/Marketing Director. Our student members will have more and larger scholarships available starting this year, thanks to a commitment from Growth Energy to provide $90,000 in funds over the next three years. The NAAE Upper Division scholarship is for NAAE student members majoring in agricultural education during the semester when they student teach. "Student teaching can be a financial strain on agricultural education majors," said Dr. Wm. Jay Jackman, NAAE Executive Director. "They spend every day teaching, so they are essentially working a full-time job with no pay. There is a national shortage of agriculture teachers, so anything we can do to help students finish their degree and get into the classroom is critical." Previously, NAAE's Upper Division Scholarships were $750 each, and approximately 15 were given each year. Growth Energy's gift means that the scholarship amounts will be doubled, and more of these larger scholarships will be awarded, beginning this year. Tom Buis, co-chair of Growth Energy noted, "There is nothing more important to the future of agriculture than those who wish to enter a career that will help further the innovation, promise and bounty of America's farmers. American agriculture and those invested in it are the backbone of this nation and Growth Energy is thrilled to help support the future leaders of this industry. We are thrilled to help support those who will write the next great chapter of American excellence by providing food, feed and fuel to move our nation forward." Students who plan to student teach in the fall of 2016 or spring 2017 should apply for a scholarship this year. Scholarship applications are due May 15, 2016. The online submission form is not yet open, but students can use the information at this link to gather all the pieces they will need to submit. Growth Energy is also a supporter of the National Teach Ag Campaign. Their gift is a special project of the National FFA Foundation. NAAE is implementing a newly revised committee process. There are seven NAAE committees. Each of the seven committees has 18 members, three members from each of the six NAAE regions. The committee chairs and committee secretaries are elected by members of the respective committees from among the 18 members of the respective committees. NAAE is seeking members to serve on these committees. One new committee member from each NAAE region, for each NAAE committee, will serve a 3-year term beginning at the conclusion of the January 2015 committee meeting and ending at the January 2018 committee meeting. In addition, NAAE is seeking one new committee member from NAAE Region I, for each committee, to fulfill a remaining 2-year term of service beginning at the conclusion of the January 2015 committee meeting and ending at the January 2017 committee meeting. Please e-mail these documents directly to the staff consultant for the respective committee. The staff consultant will then post your credentials to the respective committee space on NAAE Communities of Practice for committee members to review. Please note that these committee spaces are open for anyone to review; these are not closed communities. The first virtual committee meeting of 2015 is Strategic Planning and this meeting will be held on Monday, January 12, at 5:00 pm Eastern. So, please submit your credentials to the respective committee staff consultant as soon as possible, preferably by Friday, January 16, 2015. 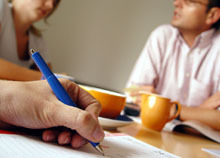 Committee members will participate in at least two virtual (web-based) committee meetings per year. Additional virtual committee meetings may be called by the committee leaders. Committee members are also encouraged, but not required, to participate in face-to-face committee activities at their respective NAAE regional meeting and at the annual NAAE convention. Click on each committee to see its leadership and read its mission. You may direct questions to any member of the NAAE board of directors, NAAE staff person, or current NAAE committee chair (please visit the respective committee space for their contact information) . At the 2013 NAAE Convention in Las Vegas, members elected a president, president-elect, two new regional vice-presidents and two new secretaries. See below for a picture of all the leadership and bios for each of the newly elected board members. After teaching high school agriculture for 25 years, Kevin accepted the position as superintendent of Oklahoma Union Public Schools earlier this year. Even though he is no longer in the agriculture classroom on a daily basis, Kevin's heart still lies with agricultural education. "The best part of my new job is that I get to advocate for agriculture in a new area," he said. "I get to talk about my leadership experiences in agriculture and NAAE and how that prepared me for the responsibilities I have today. I am also involved in local and community initiatives and serve on numerous boards. 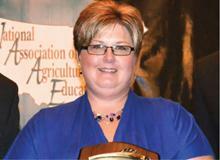 I still am and will always be involved in promoting agricultural education." 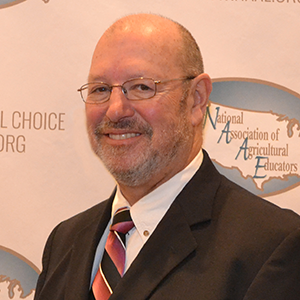 As president, Kevin will help set the direction for agricultural education on a national scale during the next year, in addition to providing leadership for NAAE's nearly 8,000 members. During his year as president, he aims to build on relationships with other organizations that value agriculture and agricultural education, finalize the implementation of the new strategic plan, and give voice to the message that agricultural education and work in the agriculture industry are worthy careers. "At the NAAE national conference, I used a salsa recipe to illustrate what makes NAAE strong," said Kevin. "By itself, each salsa ingredient is very different, but you need them all, and they all must be good quality to produce a good salsa. NAAE works closely with teacher educators, the National FFA Organization and National FFA Foundation, agricultural education state staff, agriculture business and industry, and postsecondary institutions to advance agricultural education. If we fail to take advantage of the unique flavor of each partner, the final result will be weak. NAAE is a strong organization that continues to expand its role in advancing agricultural education with the help of our many partners." Kevin credits his wife Cathy with being supportive and understanding of the long hours it takes to do his job effectively, and is proud of his two children, Blane and Cassey. Cassey is a second grade teacher at Adair Public schools in Adair, Okla. Blane has a degree in Range Ecology and is becoming a pretty good saddle bronc rider. Both were active in agricultural education and FFA. In his limited spare time, Kevin raises club calves and cheers on the Oklahoma State Cowboys. Currently an agriculture teacher at Cumberland High School in Toledo, Ill., Charlie was elected as the 2013-2014 president-elect. As president-elect, he will work with the NAAE board and staff to make the initiatives and assets of the organization more readily available to members. He also plans to spend the year working with NAAE's standing committees to help them become more functional, helping them have a greater impact on the organization. Both tasks will help NAAE continue to meet its grassroots mission of being the voice for agricultural educators on a national level. "NAAE has no equal as far as an organization that helps its members work toward a common goal," said Charlie. "No other organization can come close to making its members feel like they belong to a family and provide them with resources that help them achieve their day-to-day goals." Charlie has taught agricultural education for 30 years, and has been a NAAE member since his very first year in the classroom. He has served in multiple leadership roles both within the Illinois Association of Vocational Agriculture Teachers and NAAE. He has also been recognized multiple times for his outstanding teaching, receiving the NAAE Region IV Teacher Mentor award in 2006 and the Illinois Outstanding Agriculture Teacher award this year. Charlie lives on the farm where he was born and raised with his wife of 26 years, who is also a teacher. They have two sons, one who also teaches agriculture, and one who is a student at Eastern Illinois University. In addition to teaching, He and his wife raise purebred Shropshire sheep, Nubian goats, llamas, corn, soybeans and alfalfa on their farm. Nick is an instructor at Blue Mountain Community College in Pendleton, Ore., Like all regional vice presidents, Nick's tenure as regional vice president will last for three years, during which time he will be responsible for guiding the association's activities in his 11-state region. Nick has been teaching agriculture for 11 years, beginning as a high school agriculture teacher, and later at Blue Mountain Community college, where he has taught for the past seven years. He has received much recognition for his leadership in agricultural education, and most recently his program at BMCC was named the NAAE Outstanding Postsecondary/Adult Agricultural Education Program for Region I. Nick has also been active in leadership for agricultural education, serving in multiple roles including president of the Oregon Vocational Agriculture Teachers Association. During his time as Region I Vice President, Nick plans to improve communication to the outlying states in Region I - Alaska and Hawaii - and help agriculture teachers in those states become more involved in NAAE. He also plans to improve agriculture teacher recruitment and retention efforts in the western states and increase overall NAAE membership in Region I. "There is no question in my mind that the members of NAAE are a very cohesive family that is unlike any other teacher association," said Nick. "The focus of NAAE is for agriculture instruction, but it is also such a tremendous support group." In addition to teaching at BMCC, Nick and his wife, Chrissy, have two children who are already active in agriculture, sports and the community. They also raise and sell Red Angus bulls. 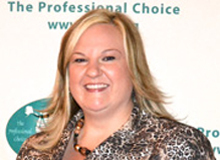 As the newly elected Vice President for Region VI, Krista will be responsible for 14 states. She has been teaching agriculture for 17 years, and has been recognized multiple times for her leadership both in the classroom and in the profession of agricultural education. She was selected as NAAE Region VI Teacher Mentor, as Pennsylvania Outstanding Agriculture Teacher, was recognized for having the Outstanding Agricultural Education program in Pennsylvania, and just this year was selected for the WGAL Teacher Impact Award. Although she appreciates the recognition, Krista uses another scale to measure her success. "My greatest rewards as an educator happen each and every day through my students," she said. "I love to see the light-bulb moments which reinforce learning and inspire further curiosity." "I have always been active in NAAE because I believe in the power of a grassroots organization to provide legislative advocacy, professional development, and networking opportunities to its members," said Krista. During her tenure as Region VI Vice President, she plans to work with each state affiliate to make sure they have a new teacher mentoring program in place, continue to promote teaching agriculture as a career opportunity, and increase the membership in her region. In addition to teaching agriculture, Krista and her husband operate Cocolamus Farm, where they raise Holstein cattle and crops. These words by Robert Frost came to me today as I've been viewing the damage of the deadly tornadoes that have struck Oklahoma. Walton Central School, Walton, N.Y.
Tina Miner-James, last year's Region VI NAAE Teacher Mentor Award winner, wasn't the first person to hold her newborn son 12 years ago. That honor went to her husband. She wasn't the second person, either. Just after being wheeled into recovery from a C-section, Miner-James got a call from the nurse's station, explaining that a very concerned student wanted to make sure she was OK.
Zach Crews, an agricultural educator at Slater School in Slater, Mo., knows that memorable classroom learning moments tend to stick with students. And there's not much more memorable than teaching a student to castrate livestock. And while he'd love to be able to teach them on a live animal, it's simply not practical. So Crews came up with the idea for a mock scrotum castration activity. Don't miss out on all the action! NAAE will hold its 2013 convention in Las Vegas Dec. 3-7. Early bird registration ends July 12. Click here to reserve your room at the Riviera Hotel and Casino ($49 weekdays, $72 weekends). Well begun may be half done, but it is the second half of our work that is the most important: sustainability and results. A rundown of recent events in national politics and how they affect agricultural education. Ever wondered how other ag educators make room in their budgets for CASE curricula? Here's one young teacher's experience. McKenzie Baecker, Emilia Dover, Amanda Forstater and Tyler Price make up this year's fantasic class of interns. Meet them here! An experienced welder, Judy often performs safety demonstrations and travels to high schools and colleges. 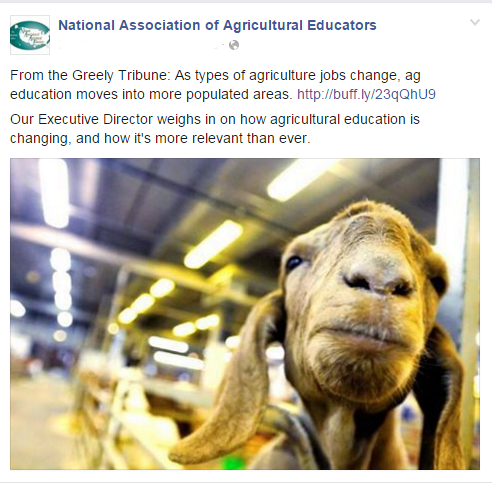 How do you recruit new ag teachers? How do you reach out to support your colleagues? Send us your best ag teacher recruitment and retention tips, especially pictures or videos, by July 1. If we choose your tip for the next News & Views, we'll send you a Teach Ag t-shirt! Check out these free animal production and environmental stewardship lessons from Montana State University Extension. The Oklahoma City tornado and Newtown shootings brought teachers' dedication into the spotlight. Do people respect teachers more today? We can't get enough of the Peterson Brothers' Life of a Farmer video series. Click here for the latest installment of video fun! Look out! Ag teachers are taking Pinterest by storm. July 1 starts the new NAAE membership year! Click here for tools to help you recruit new members. Like us on Facebook. Follow us on Twitter. Awesome. I hope this finds everyone doing well. I know weather conditions vary all across the country, but we are certainly feeling spring weather down in central Florida. I think my students went from hoodies to shorts in a matter of days this year. Each year at our winter meeting, our board takes a look at all comments and activity ratings from the NAAE Convention and uses those to make improvements in next year's convention. Housatonic Valley Regional High School in Falls Village Connecticut! Way to go, guys! Housatonic's video was chosen because our judges thought it did the best job of showcasing what agricultural education is all about - college and career readiness - in a creative and succinct way. Watch Housatonic's video and see the two honorable mention winners. Read how the recent ACTE National Policy Seminar inspired this teacher to create a whole new unit on advocacy. Nestled at the base of the Blue Mountains in eastern Oregon, Blue Mountain Community College has one of only three postsecondary two-year agriculture programs in the state. BMCC's three agriculture instructors have built a well-rounded program with first-class instruction, a focus on hands-on, practical education, and strong community support. The result is one of the top postsecondary agricultural education programs in the United States. How will you define agricultural education's benefit to others? 2012 Agribusiness Job Report from AgCareers.com. What's the #1 way you advocate for your program? 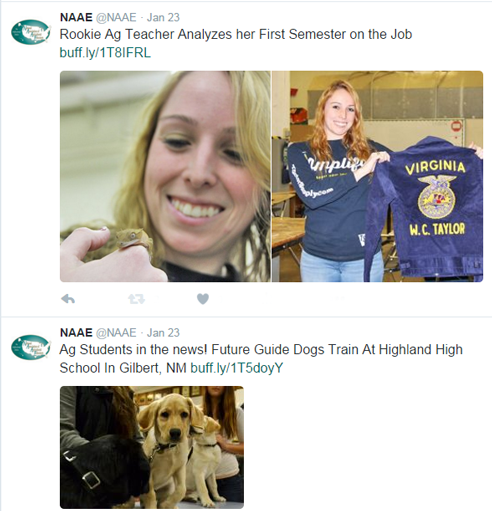 NAAE members are the driving force behind this self-serve online community. Best tool you never heard of. Media contacts. Legislation & representative info. "Our philosophy is hands-on and hands-in agricultural education," said Nick Nelson, one of the agriculture instructors at BMCC. The program maintains a 100-acre working farm, and involves students in all aspects of its management and maintenance. Although total agriculture program enrollment is 115, each class is capped at a low number of students to allow one-on-one interaction and advising. All the instructors in the BMCC agriculture program maintain an open-door policy and evolve from instructors to advisors to mentors as their students mature through the program and continue on to four year institutions or to start their own agriculture enterprises. One reason Nelson believes BMCC's agriculture program has been so successful is because instructors are always on the lookout for new courses that will captivate student interest. They recently created a course in agriculture sales and auctioneering that culminated with students hosting and running a surplus auction. BMCC is also the first institution in Oregon to have a state-approved stock dog class, which teaches students and working dogs effective livestock handling techniques. Another important factor in BMCC's success is the continual professional self-improvement pursued by the three instructors. They not only keep abreast of advances in agricultural technology, but in educational pedagogy related to non-traditional and adult learners, constantly tweaking their teaching to better reach their core audiences. They maintain an active role in a host of state and national professional organizations, both agricultural and educational, and use these opportunities to become leaders in the profession. Also important is the BMCC Agriculture Department's community involvement and strong advisory committee. "Our students, staff and program are the success they are due in great part to the community and agriculture industry that supports us," said Nelson. The department's community extends well beyond the borders of Pendleton, or even the state, since thirty percent of its students are not from Oregon. "After graduation these students return home and become our best recruiters and supporters,"said Nelson. "I am proud of the impact the BMCC agriculture program has on our region and on the state," said John Turner, BMCC president. "The program is well-known and respected by the entire agri-business community. Agriculture is one of the foundational programs of the college and its success is largely due to the superb instructors at BMCC." As the 2012 Region I Outstanding Postsecondary/Adult Agricultural Education Program award winner, BMCC's agriculture department was awarded a two-year lease on a Toyota Tundra, presented by Campbell Toyota during the annual BMCC Boxing Blowout. The NAAE Postsecondary/Adult Agricultural Education Program award is sponsored by Toyota as a special project of the National FFA Foundation. 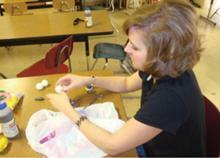 For more information about this and all other NAAE awards, visit http://www.naae.org/awards/applications/. I had a thrilling moment today when a former student told me that she is considering teaching agriculture and switching majors from Elementary Education. It's time to apply for a NAAE award! Applying for an award is a great way to reflect on your accomplishments and show your value to administration. Don't forget that you can nominate partners and mentors as well! Students' focus wandering? Try wheeling in a cow skeleton. That will get their attention. At least it worked for Trent Van Leuven, one of our 2012 Ideas Unlimited award winners. Since she started teaching agriculture, Carmelita Goossen has turned around a declining program and discovered the power of inquiry-based learning. She's single-handedly created curriculum that draws on both her students' cultural backgrounds and connections with the omnipresent meat industry in her corner of southwest Kansas. She's a certified ESL instructor, a DuPont National Agriscience Teacher Ambassador, and was this year a national candidate for Outstanding New Career and Technical Educator of the Year. That was the first five years. Imagine what she'll do in the next 25. Need a little inspiration? Teach Ag coordinator Ellen Thompson wants to know "Who will you dedicate the game to?" Animal & Plant Biotechnology gears up for its first real year, and Natural Resources & Ecology needs field test teachers. CTE month, the State of the Union address, advocacy resources, and the upcoming National Policy Seminar with Ag Ed Strand. Did you watch The Summit online? 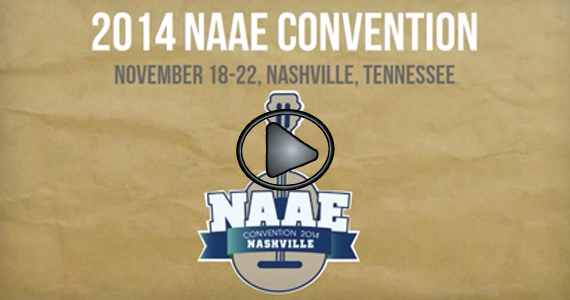 Outlines NAAE award categories, eligibility & more. Great for state leaders.